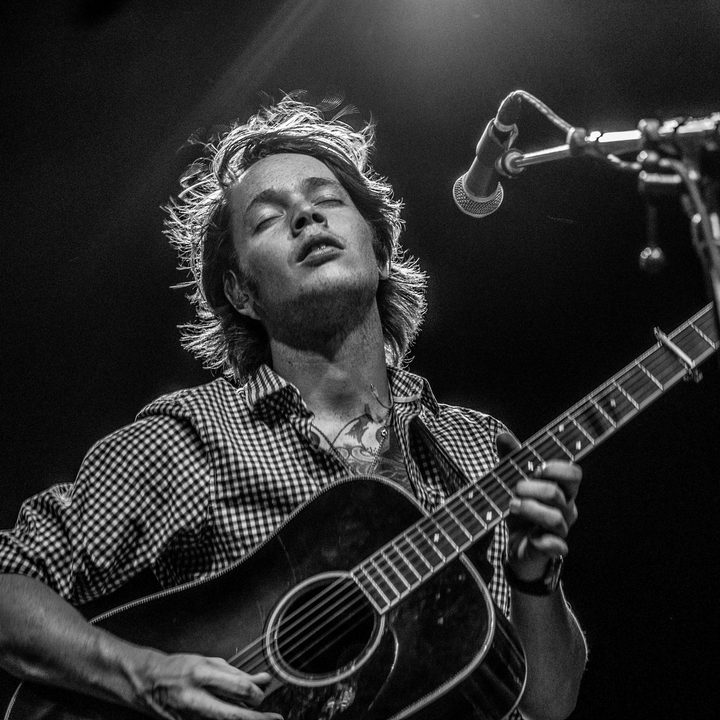 Watching guitarist Billy Strings onstage is akin to observing a hummingbird in its natural state. Strings’ fingers zoom up and down the fretboard of his acoustic in an intricate and calculated frenzy. The scene may appear haphazard at first, but he’s in complete control, determinedly chasing that cosmic moment of improvisation. At 26, Strings (a.k.a. : William Apostol) is one of the fastest rising pickers of the last decade. Hailing from rural central Michigan, Strings (he was given the nickname by his aunt who recognized his abilities early on) has been a road dog for several years now, playing upwards of 200 gigs a year with his band, their black Sprinter van and a gear trailer. In 2017, he released the album Turmoil & Tinfoil, a collection of songs that, while based around the tenets of bluegrass, isn’t afraid to look forward or celebrate youth. “You can’t stop us from dancing/ you can’t stop us from feeling high/ we can’t help it if we like to stay out all night,” Strings sings in the lead-off track “On the Line.” In the song “Dealing Despair,” he addresses the rising tide of hate in the U.S., howling, “You know I don’t want your opinion, I just want to blow out your brains.” Edgy stuff, to be sure. Whether or not Strings “is” or “is not” bluegrass is up to a purist’s interpretation. But to his growing base of fans, he’s undeniably a thrilling live artist, delivering frenetic, head-banging performances that have made him a favorite of festival crowds. His “King & Strings” collaboration, with his electric guitar counterpart Marcus King, was the stuff of legend at Virginia’s Rooster Walk festival last summer. It’s Strings’ own family that first exposed him to bluegrass. He was raised on the “high, lonesome sound” by his stepfather Terry Barber, a well-regarded guitar picker in his own right within Michigan and Midwestern bluegrass circles. Last June, Strings’ personal and professional life came full circle when he found himself opening for the Del McCoury Band at Nashville’s Ryman Auditorium, the onetime home of the Grand Ole Opry (Strings will make his Opry debut in March). At one point in the show, Strings appeared onstage to sing a duet with McCoury, with Barber by his side. For a short period in 2017, Strings found himself playing guitar in the David Grisman Bluegrass Experience. Known throughout his life as “Dawg,” the 73-year-old took Strings under his wing, sharing his knowledge and wisdom, something that’s at the heart of why folks are so attracted to the sounds, culture and lore that is bluegrass. It’s that notion of being “close to the source” — taking the time to sit and learn from the elders and passing it along — that Strings, like many bluegrass pickers, keeps top of mind. Still, he’s compelled to go against the grain as needed. And be open to other genres too. He cites Jimi Hendrix, Pearl Jam and the death metal of his past as sounds that inspire him as a songwriter. However, as a fiercely independent artist, Strings isn’t willing to give up all control. “We’re not going anywhere we don’t want to be,” he says. It’s that sense of rebellious freedom, both artistic and personal, that continues to motivate the phenom, who will launch a lengthy winter tour January 24th in Bloomington, Indiana.